Bones & Branches: Redux: Palmyra Mysteries: More Questions than Answers? Redux: Palmyra Mysteries: More Questions than Answers? In my last post, I described my visit with my father’s cousin (or my first cousin once removed! ), and the wealth of family photographs that he shared with me. Following that visit I drove north to Wayne County, to research William and Sophia Aylard’s life there in the 1850s. It appears that my ancestors left a light footprint in Palmyra. One resource I was eager to see was the 1855 New York State Census for Palmyra, as I knew William and Sophia were likely to be listed in it. I was pleased to find, in fact, that they are. The quality of the microfilmed copy that I was viewing was poor, and it appeared that the original document had probably suffered considerable wear-and-tear, and perhaps water damage. 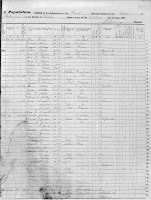 Additionally, the census taker recorded the family surname incorrectly, as Allard. The census lists William (age 40) and Sophia (32), Sophia’s son, David (13) and William’s two surviving children by his previous wife, Sarah (11) and William (7). It also includes the couple’s two mutual children, Harriet (“Hattie”), age 1, and Mary Jane (“Jennie”), two months old. One curious tidbit that deserves further investigation: the census lists the family as residents of Palmyra for two years, meaning they had apparently arrived sometime in 1853. Most reliable information I have indicates that the family emigrated from England in 1851, so the census suggests that they lived somewhere else for two years. Where? I have not seen any information to determine an answer, although my best guess would be somewhere else in New York state, possibly New York City, or perhaps even somewhere in Canada, depending on their migration path. If I can ever locate the ship records for their Atlantic crossing, that will almost certainly shed light on the question. It is interesting to note that Palmyra is, in fact, the purported birthplace of the Book of Mormon. I stayed in a hotel that was within walking distance of the hill where Joseph Smith claimed to have found the golden tablets from which the Book of Mormon is said to be derived. However, Smith and the nascent Mormon movement had left Palmyra long before our Aylard ancestors arrived there, so I do not think that connection had any bearing on their decision to live there. Perhaps a more significant connection had to do with alcohol. William is listed in an 1851 business directory for Soham, England, as a retailer of ales. His official employment was that of a carpenter, but apparently he ran some kind of pub on the side, too. 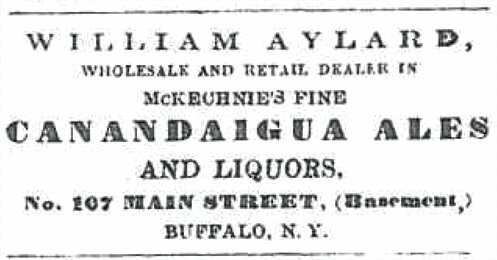 Not long ago I discovered advertisements in 1858 editions of the Buffalo News for a William Aylard selling "McKechnie's Fine Canandaigua Ales and Liquors". William's son was too young to have begun such a business, and the only other William Aylard that I know of who was living in the United States at the time was a painter living in Cleveland, Ohio, who always used his middle initial: William H. Aylard. My great-great grandfather seemed the likely candidate for this business. And Canandaigua is the name of a town and a lake located just southeast of Palmyra, so that seemed to firm up the connection. During my recent research, I discovered that McKechnie, in fact, originally produced his Canandaigua Ales right in Palmyra! This lends further credence to my theory that William Aylard was trying to ship these products the one-hundred miles from Palmyra to Buffalo, almost certainly relying on the Erie Canal. Palmyra was a lock port along the canal, and Buffalo was its western terminus. Whether the distribution of alcohol was his motive for moving to Palmyra, or whether it simply blossomed once he saw what looked like an opportunity, I am not sure. But it seems that he was likely more motivated by the sale of alcohol than by the attendance of church, based on my preliminary research. Friday is my last day of research, as I will fly back home to California early Saturday morning. I spent most of the day today (Thursday) in the vault of the Medina County Probate Court where many of the records of births, deaths, and marriages are stored from the era before the state took over this record-keeping in the early twentieth century. I will provide more information on my findings there in a future post. I have republished this post from my previous blog, Aylard Family Research.